Mark Palmerston | My personal journey as a husband, parent, educator, and student. My personal journey as a husband, parent, educator, and student. These are my personal reflections after reading Pasi Sahlberg’s Finnish Lessons, created and cross-posted to discussions as part of my Educational Leadership coursework. Pasi Sahlberg in Finnish Lessons focuses on giving a comprehensive description of the education system in Finland by providing a historical, political, and social look at factors that have supported the rise in student achievement since the 1970’s. In attempting to provide lessons for other countries, I feel the central message is summed up by the following quote, “educational excellence has been attained because Finland has chosen an alternative way in its educational reform, often almost in opposition to the global educational reform movement.” (Sahlberg, 2012, 149). 1. Sahlberg (2012) emphasizes the strong connections between educational, political and social policies as a key driver of success. We can learn a tremendous lesson by looking at education as not a separate issue, but in connection with greater review of political, health and weallness, and social policies. 2 Sahlberg (2012) repeatedly points out that the Finland has not created much innovation, but instead has relied on research from other countries like the US. From this, I feel that he is saying that American education systems already have many of the answers, we need to review and reflect on our own implementation to promote greater success. 3. While improvements in Finland have taken place over a relatively short period of time (20-30 years), many of the changes, other than “peruskoulu”, seem to be incremental. The accumulation of these incremental changes provide for the systematic transformation that has promoted success at a high level. I believe this is a lesson for the US in that leaders and policy makers should focus on the long-term, rather than the next best thing. Connecting the latter thought to the need for “disruptive” innovation, I get the feeling we are looking for a single big change or event, like winning the lottery, that will forever change our educational system. I am not certain that we need a magic bullet, but instead like the thoughts of Sahlberg (2012) that “not yet another educational reform but renewal, a continuous systemic transformation of teaching and learning, step-by-step” (p. 168) will move American education forward. While I hear her talking more philosophically about the thought process and internal capacities, I would extend these three with the capability to apply these through a willingness and ability to collaborate with others. Not only should you be able to think how it would be in someone else’s shoes, but you should be able to apply that knowledge, the capability of being empathetic, through practical actions of working together to solve issues, engage in general discourse, and challenge others respectfully through questioning. While I agree with her notions, I may not believe as strongly that the humanities and arts are the only way to teach this. She seems to push very strongly, to the point that I hear, these are the only way to teach these capabilities. I believe the arts, humanities, and philosophy are a valuable aspect of education, but not the only way to teach the skills and capabilities needed in the 21st Century; a balance, and not large disregard being most appropriate. It is imperative for educational leaders to consider the rapid changing environment, when establishing goals and setting policy for the next 20 years. Policy should better promote the learning and application of capabilities Nassbaum describes: capacity to self-examine and think critically, a sense of global citizenship, and authentic empathy. I believe educational leaders should also consider the question: how does policy impact the motivation of all, adults and children, in achieving great success? Two current topics that specifically impact motivation are the design and implementation of current state-mandated testing and accountability systems, and teacher evaluations linked to student achievement. To remain relevant, meaningful, and effective, education must move to a more personalized model of instruction, with the ability to identify and support students’ unique and individual needs; supporting a narrowing of the achievement gap, and motivating students and staff on an individual level. Education must embrace change, and open itself up to real improvement on a continuous basis. I personally also believe that the education community must be more open to a greater variety of options, not a one-size fits all option, but a realization that trying to meet all student needs with a single model only diminishes quality and extends inequalities. I received a copy of Tony Hsieh’s Delivering Happiness: A Pathway to Profits, Passion, and Purpose. The person who gave it to me was spot on with the fact that I would find strong connections to the passion and the core values expressed by Tony. In morning, our office internet stopped working. I made the call to Verizon to find out if the problem was on their end or whether I needed to get our IT guy in to fix an issue on our end. My customer service person, CJ, was very patient and calm, I was as well, with the troubleshooting he requested. At one hour into our conversation he said, for about the fifth time, “I need to try the line test again, I haven’t been able to get it to work”. When he returned from placing me on hold he asked me to reset the model (4th time during the conversation). I let him know that he had been patient and so had I, however I needed the issue solved without more time on the phone. I asked if he would be able to escalate the call, or solve the issue and call back without me remaining on the phone. He did not respond to my question, instead repeated his request to have me continue troubleshooting. I let him know I would be happy to, after he answered my question. He said he would escalate the call; however after 5 minutes on hold, he returned to tell me that I would be on hold for “awhile” to get to the next level and that we should continue working or “I could research issue and call you back”. I thanked him and let him know I would appreciate their quick attention to the issue and to return my call when it was fixed. While I would expect this to be an isolated incident, it unfortunately is my repeated experience with Verizon. In the afternoon I was visiting a learning center to attend a conference with a parent and teacher. A parent, whose child attended our school 5 years ago, called to inquire about re-enrolling for the fall. Having built a relationship with the parent, I was more than happy to take the call. Having spoken with the parent two or three times in the past 5 years, her first question was about my young children. We had a short and very pleasant conversation, at the conclusion I let her know I would have someone follow-up with her in the morning when they returned to the office. At the end of the day, I found myself at Smart and Final with a request that was out of the ordinary. I had purchased a cash card, which seemed to not have been activated. Because of this, the teacher who was to use the card had to spend their own money and get reimbursed for the supplies needed. My request was to “return” the cash card and receive a refund on the credit card used to purchase it. After they too struggled to figure out the balance of the card, they did figure out that it did have the correct amount of money and had been activated. Matt and Cole both took their time, were very patient, and understood the request was a bit unusual. They took the time to call their support line and explain the situation to ask if this was possible. Matt addressed the issue, outside of normal procedures, to help ensure that I was a satisfied customer. My reflection on the day, and my reading, really made me think about a seemingly routine phone call; had I left the parent feeling like I did after my experience with Verizon or Smart and Final? Had I gone above and beyond to cultivate the relationship and leave the parent feeling well connected with our school program? Tony expressed the understanding that each and every customer was important and with my school, the same is true; each conversation, each interaction, seemingly significant or not, is an opportunity to engage students and families in changing our community. It is always interesting to me to find other school leaders who do not see direct transferable principles between many business books and school leadership, I have found such great insight into my own personal leadership from reading a variety of business leadership books. As a follow-up to Delivering Happiness, I have started reading Grow Regardless by Joe Mechlinski. I see many direct correlations to what Tony describes at Zappos, with more practical application of steps to take to identify core values, tell your story, and build strong relationships.. Here is my first attempt at creating an infographic. The content of this infographic specifically compares 1:1 vs. BYOD as a way to help guide my organization’s thinking about mobile learning environments. A few things came together as I am thinking more and more about blended learning, what it means, and how more traditional programs (traditional teaching models as well as Independent Study) could transform student learning by incorporating aspects of blended learning into their programs. @markpalmerston Sounds interesting. What does “Flex” mean to you? What’s next? Well, I’ll be down in San Diego this week for the California Charter Schools Association (CCSA) annual conference. One of the topics I’ll be looking for is exactly this. My Personal Learning Network is ever expanding, more rapidly now as I leverage more resources online, and as a result, having a greater impact on my personal and professional practice. The following Prezi illustrates how I see my PLN as of today, March 7, 2013. LinkedIn I use as a professional networking tool and a source of professional information. Twitter has really expanded my view of social networking, it forced me to face my fears, and really helped me connect with others and gather a huge amount of information in a much more efficient way than my RSS feeds allow. While I still feel like much of my activities are viewing information, I am working to find my voice and share more content on twitter. I actively use Google Apps for Education, both personally and in my working world to very much connect, gather, and share information. 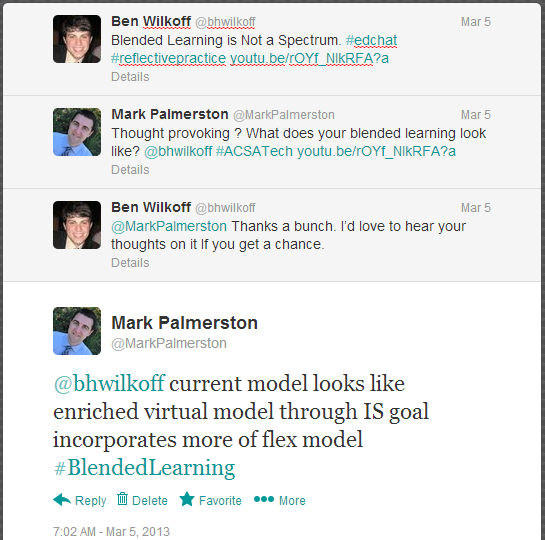 One emerging tool that I am exploring more is Google+. To create digital content, I have really been enjoying making Xtranormal videos. While this, and my friend Voki, are newer tools for me, I have several ongoing favorite tools that I use to create Digital Content. In my professional environment, I use Google Sites to create internal websites for our schoolwide professional development as well as a separate site to organize and share our internal documents. I love using Prezi for any and all presentations, and have found it to be a great tool to visually display and organize complex thoughts and processes. Finally my blog; I started a blog a few months ago to reflect on my professional practice, connect with others, and share openly. While I am still finding my voice, I see such great value in creating and sharing content in this way. I am always searching for better ways to organize content. I love iGoogle and have used this for a long time to organize and manage my RSS feeds. As iGoogle is going away, I have started to use Google Reader, and on my iPhone the Feedly app to organize my feeds. I have started using paper.li, and enjoy the ease and visual appeal. I have shared two paper’s one on my personal feeds (food, business, sports, and local news) and one on educational information that I follow. I would like to improve in this area by finding better iPhone apps to organize, view, share and manage my use of twitter and online feeds. My current learning environments are very important to me, and I hope that I am working to more fully engage in and blur the lines between my online and offline learning. Online I have been exploring MOOC’s through Coursera and #etmooc, both with mixed success. I see great value in these learning environments, but have found that a more traditional cohort learning model has provided me with greater success. My offline learning environments being highlight by the students, staff, and families at my school, along with coworkers, professional connections, and the community provide great opportunities to collaborate and share. As more of my learning blends the online and offline environment, I am continuing to seek out cohort learning models, which include my ACSA Innovative Technology Academy (#ACSATech) and my future learning experiences through California Lutheran University’s Doctorate of Education program which I plan to begin this June. I invite you to come join my PLN to connect, gather, and share information. It’s been a week since expanding my #edtech learning to include both the blended learning #ACSATech Innovative Technology Academy based upon the Leading Edge Certification for Administrators and the Massive Open Online Course #ETMOOC. Both have provided me with similar, yet different, learning opportunities that have made me think more deeply about my own learning as well as what and how I share with others. The graphic below came to mind when reflecting on my first week of #ETMOOC, but took on new meaning when compared with my experiences in #ACSATech. During the first week of #ETMOOC I made it to the orientation, in real time, last Monday. I had my laptop logged into Blackboard, the Chromebook I am experimenting with, logged into Twitter, and my phone handy as well. I was fully engaged. While I had to leave before all of the questions were finished, I was moved by the power of the global community and interactions over multiple mediums which I thought enhanced my connection with the content presented. Contrast this with my experiences watching the Introduction to Twitter and Social Curation from the archives. Without the sense of a real-time community and the active Twitter chat, my engagement and interest fell flat. I began thinking more deeply about my own level of engagement and, as a result, my own learning experience through synchronous vs. asynchronous online work. I was really convinced this was the difference. Contrast this again with my first week in #ACSATech: one day of in person engagement with a much smaller group (about 30) followed by the coursework, between now and the end of February, completed online asynchronously. My level of engagement has been high: interested in engaging with others, reviewing each message posted, commenting, sharing, reflecting on those that jump out at me or those that I feel I have something to offer. When thinking back on the week, comparing the two learning modules, my personal learning and engagement has more to do with relationships than synchronous vs. asynchronous learning. Having the in person connections, smaller group and local relationships with members of the #ACSATech cohort, and the live, real-time relationships and interactions with #ETMOOC, I find myself most engaged and ready to learn. I am looking forward to building new relationships through both learning experiences, as well as strengthening my own learning and sharing in the process.